Spurred by the centenary of the Amritsar massacre, Phil Willmott sets this tragic tale of love, jealousy and vengeance in India during the British Raj, casting Othello as an Officer – one of the few Indian soldiers who made it through training at Sandhurst and back to a position of command in the British army. Within the rich tapestry of plot, characters and language Shakespeare epitomises the malevolent aspect of human nature, sparked by its undermining negative feelings of resentment, envy and insecurity. 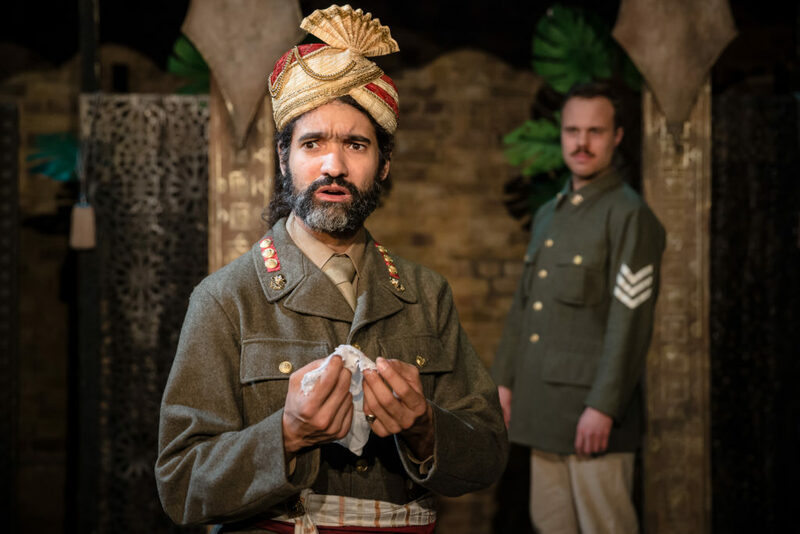 He also brings to light the subject of racism and in this production, we are reminded of the abhorrent attitude towards Indians in their own country. Inferior in rank and whose lower-class British background prevents any hope of promotion, Iago seethes with rancour and orchestrates those around him in an evil revenge; Othello, weakened by self-doubt, falls into the trap. The scene is set with a tastefully oriental design and some strongly patriotic piano playing. But once the plot begins to unfurl, the background fades. Despite the resetting, it is the words which define the narrative and the dimensions and balance of the characters which bring context. Matthew Wade creates the impression of a young, earnest General, helplessly in love; he lacks the majestic quality of the original experienced warrior which makes his downfall by a malicious, conniving underdog so tragic. Rikki Lawton’s powerful rendering of a more identifiably modern Iago dominates the action and his psychopathic nature eclipses a personal hatred, making Othello simply another of his victims. With his significance diminished, this becomes Iago’s story. Despite the imbalance we can enjoy the colonial flavour through the atmospheric set (Justin Williams and Jonny Rust), Zoe Burnham’s sublime, cinematographic lighting, detailed costumes, (Penn O’Gara) and solid, nuanced interpretations all round. In particular, Jerome Dowling’s Cassio wins our empathy as he is caught unawares in Iago’s net. As Desdemona, Carlotta De Gregori portrays the incomprehension and suffering of her husband’s turn of face with great sensitivity, but her initial coquettish behaviour towards him only hinders our perception of his standing. And a spirited Emilia (Claire Lloyd) adds plausibility to the era through her accent and demeanour, though fails to grow into the play’s increasing tension. This modern take on ‘Othello’ has all the ingredients of success – some excellent acting, purposeful direction and evocative visuals – but as a consequence of the weight of importance between Iago and Othello on stage, it is in retrospect rather than a reaction to the drama that we feel the relevance of Willmott’s fresh approach.